After an afternoon to remember at Elderstubbs, we aim to continue our sublime form in the United Counties League Premier Division and a trip to Braybrooke Road to face Desborough Town, on Saturday (3pm). The Ar Tarn are ninth in the table after a little dip of three matches without a win since a 3-1 home win over Sleaford Town. Before that, Chris Bradshaw’s men had won six of ten and picked up a draw with Wellingborough Town. Aiden Bradshaw has caught the eye since signing for his second stint with Desborough last season and he’s been ever present at Braybrooke Road. He’s started the season well with four goals in his 29 Premier Division appearances. A determined right-sided utility player, Bradshaw, still only 22, and previously represented with Kettering Town and AFC Rushden & Diamonds, plus loan moves to Thrapston Town and Sileby Rangers, before moving to Desborough. 25 September, 2018 – Town 3-0 Desborough Town – United Counties League Knock Out Cup 1st Rd – Emery (12), Creaney (51pen), Moussi (83). 18 September, 2018 – Desborough Town 1-1 Town (Desboro’ win 5-4 on pens) – Northants FA Hillier Cup 1st Rd – Orosz (50). It’s been a bit of a rollercoaster in Chris Bradshaw’s second stint in charge. Desborough started with one defeat in their first seven matches in the Premier Division, but form turned around by Ar Tarn winning two of their next seven. They were unlucky to lose to Cadbury Athletic in the FA Vase and that has sparked a run of five matches without a defeat. They came from behind against Deeping but couldn’t hold out for draw and looked in with a shout last time out at Holbeach last weekend, only for Josh Ford to respond and take the game away from them 1-0. 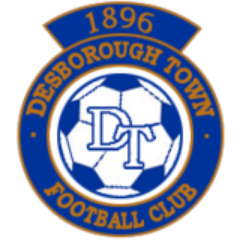 Desborough go into this weekend sitting ninth.